Many women out there find it hard to apply makeup especially on the eyes. But I do believe everything can be learned and practice makes it perfect. I'm not a professional nor did I went to special classes to learn makeup. When I'm free, I practice on the comfort of my home so I'm going to share with you how to do the basics of applying eyeshadow. When applying eyeshadows remember to use 3 shades of eyeshadow color (dark, medium and light). Preparation: Apply eye primer (optional). This prevents your eyeshadow from creasing especially powdered ones. Doing so makes the eyeshadow colors look more vibrant and last longer. Tip: You can also use your face primer or base. 1. Apply the light eyeshadow color on your entire eyelid. 2. Apply the dark eyeshadow color on the outer corner of the eye. Think of drawing a letter "C" on the outer corner of your eye. 3. Apply the medium eyeshadow on the crease. 4. Blend the light eyeshadow and the dark eyeshadow shade using the medium eyeshadow shade. 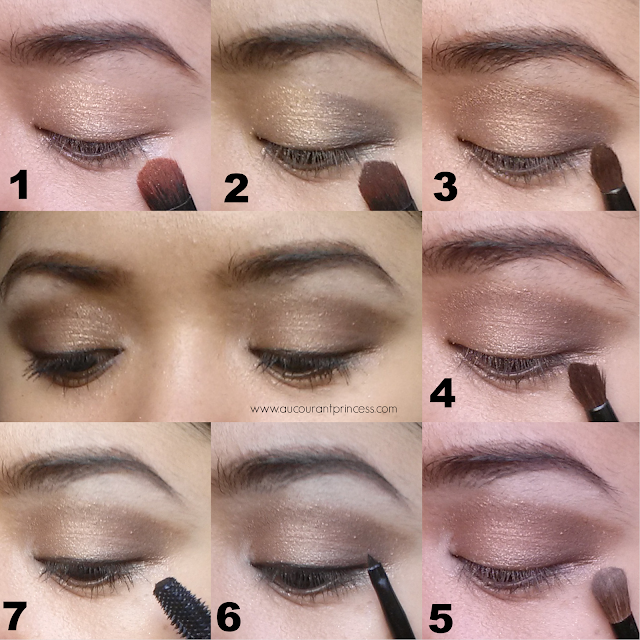 Note: Steps 2 and 3 can also be applied to hooded eyelids and mono lids. Instead of following the crease follow where your eye socket is. That means applying the colors a little higher from the eyes. Another way is applying the dark shade closer to the lash line and medium shade in between the dark and light shade. The secret of applying eyeshadow is blending. So take your time to blend, blend, blend and enjoy while doing it. 5. Highlight your brows and inner corner of your eyes. Use the light eyeshadow color. Highlighting the inner corners of your eyes gives the illusion of a bigger and wider eyes especially if you got small eyes. 6. Apply eyeliner on the upper eyelids. Make it as close to the lash line as possible. This creates an illusion of fuller lashes. Wing it if you will. 7. Curl your lashes and apply mascara. Continue applying makeup with the rest of your face. Check out my post on How To Enhance Your Look Through Makeup. Note: If your eyes are heavy (intense eyeshadow colors applied) apply glossy or light lip color and if lips are bold light shades should be applied on the eyes. You can add or make adjustments to your application of eyeshadows, blush, lipstick, etc. according to your preference. Remember to keep everything balance and don't overdo it. It's that simple. You don't need to be a professional or anything to learn the tricks of makeup. You can be as good as them as long as you keep practicing and experimenting on your own. Start from the basics and from there you can create more looks that enhances and flatters your facial features.